The Learning Garden at Venice High School is offering an exciting new seminar (lunch included)! 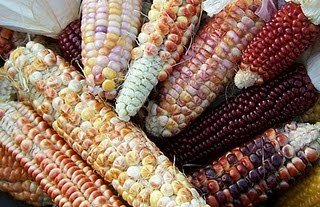 Genetic diversity is evident in these ears of corn (pictured), all from the same batch of seed... this richness must be preserved! Seed saving has become a “must-know” skill as people have recognized how utterly essential seeds are to our ability to survive. Generations before us understood the importance of saving seeds. Saving seeds to plant in the coming year was essential and, long before science showed the why of it, humankind understood we could select the best plants and improve the varieties we depended upon. This vital connection was lost as we began to purchase our seeds from seed sellers making the need to save seed seem less relevant. In recent times, we are confronted with GMOs and monster corporations controlling the seeds they created and with that came the very real specter of seed corporations having control over the food supply. those delicious open-pollinated varieties that were bred to taste good. a wider range of vegetable varieties that aren't often available through catalogs. a closer participation in the cycle of life. a hedge against our own personal misfortune of losing a job or other financial setback. a safeguard against food shortages caused by natural or man-made disasters. with our own means to mitigate against global climate change and it's impact on agriculture. the means to fight our shrinking biodiversity. Seed saving enhances the gardening experience even more because good gardeners become better gardeners and some will go on to create unique open-pollinated vegetable varieties – adapted to our local area! the presence of GMOs in our food. the preservation of old 'heirloom' vegetable varieties. equal access to good clean healthy food for everyone regardless of economic status. our ability to produce vegetables acclimatized to our local (and very unique) Los Angeles climate. the future of seeds and food! to plan for your seed saving – things to do to enable success. how different plants are pollinated and what that means to saving seed. to identify different plant families and how that affects the seed-saving process. the best time to pick for the best seed viability. to ensure your seed is kept pure from other varieties and unwanted characteristics. to clean and dry different seeds and other processes for optimum storage. the equipment and essential supplies you will have to have if you want to save some seeds and what you won't need for MOST seeds. Taught by The Learning Garden's Gardenmaster, David King, this seminar will emphasize how to do it and practical examples will show everyone how to best save the more common vegetable seeds with information on saving all kinds of seeds included. David King is an experienced lecturer, well-known for practical seminars that are accessible and informative. The lively lectures, full of quirky humor, move through the topic, getting to the heart of the matter without a lot of extra jargon, but with the data you need to get out and save some seeds! Venue: The seminar will take place at The Learning Garden at Venice High School, at the corner of Venice Boulevard and Walgrove. Enter through the gate on Walgrove. Street parking available. Weather permitting, the seminar will be held outside. The Learning Garden is usually cooler than any other place in Los Angeles, thanks to the three large trees shading the patio, so please dress warmly. If it is too cold, we will meet indoors. Seating is limited and we expect to fill! Members of Seed Library of Los Angeles (SLOLA) will receive a $5 discount. All other attendees will become members of the Seed Library of Los Angeles ($5 of your registration fee will automatically go to SLOLA for your membership).